Make The Best Use Of Your Limited Space With This Bunk-Bed In Unfinished Solid Wood Premium Douglas Fir with Stair Bookcase. Sleep in style with the customizable, space-saving design of the Dorel Living Sierra Bunk Bed. Enhance the decor of your children's bedroom while saving space with this rustic twin bunk bed. This stackable bunk bed is made of solid pine wood and includes top and bottom twin bed frames and rails. Panel Post Bunk Bed. Available In Two Sizes: Twin/Twin Panel Post Bed or Full/Full Size Panel Post Bunk Bed. This Bunk Bed Is Made Of Solid Pine Wood And Includes Top And Bottom Bed Frames And Rails. Solid Yellow Pine wood Twin over Twin Bunk Bed. Strong Construction. Ginger Stain. Comes ready to assemble. Solid Pine Wood. The stunning beauty of the Bookcase Twin over Twin Bunk Bed is matched only by its titanic strength, setting it far apart from others of its kind. Solid Pine Wood Bunk Bed With Panel. Available in Twin/Twin or Twin/Full. 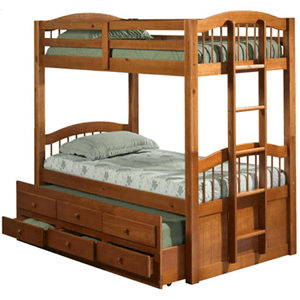 This bed is made of solid pine wood and includes top and bottom twin bed frames, ladder and trundle unit. Solid Pine Wood Bunk Bed with Stairs. With A Casual Space Saving Design, This Twin Over Twin Bunk Bed Will Make A Wonderful Addition To A Youth Bedroom. Solid Pine Wood Bunk Bed with Stairs Twin/Full. Create a warm, restful environment with the Mainstays - Twin-Over-Twin Wood Bunk Bed thats a practical, space-saving solution for siblings and friends. Solid Pine Bunk Bed 2-1/2 Post: Twin/Twin Convertible. Easy to assemble. Comes with ladder and rails. Also available in Glossy White and Glossy Cherry Finish. Mattress is not included.Size: 80 In. x 41.5 In. x 61.5 In. High*In stock. This product normally leaves our warehouse within 1-2 business days. *Quantity Discount Available. Bunkbed in Honeypine color,comes with Euro slats.Twin/Twin Convertible. Easy to assemble. Comes with ladder and rails.Size: 80 x 41.5 x 61.5 High. Natural wood bunk bed. Twin/Twin Convertible. Easy to assemble. Comes with ladder and rails. Solid Wood Beech Finish Bunk Bed. Mattress is not included. Easy to assemble.Size: 79 In. x 39.5 In. Stylish slumber is easily achieved with the Pkolino Letto Twin Bunk Bed. Designed with durability in mind, it is made of pine wood and is available in 4 playful finishes. All wood bunk beds meet safety standards and are versatile. All sets of bunks can be converted into 2 separate beds with ease. Solid Wood Beech Finish Bunk Bed. Easy to assemble. Strong Construction. Mattress is not included in the price.Size: Top 79 In. x 54 In. Bottom 79 In. x 39 In. All wood bunk beds meet safety standards and are versatile. All sets of bunks can be converted into 2 separate beds with ease. Accessories for bunk bed sales can be added at any time. 3 In. post bunk bed 74 In. tall Available in Satin Mahogany, Whitewash, Java and Satin Honey Pine finishes Ladder is equipped with rubberized hooks to prevent scratching . Stairway Solid Wood Twin/ Twin or Twin/ Full Bunk Bed, Featuring Drawer-Storage Staircase with Optional Under bed Drawers, in Honey Pine Finish.